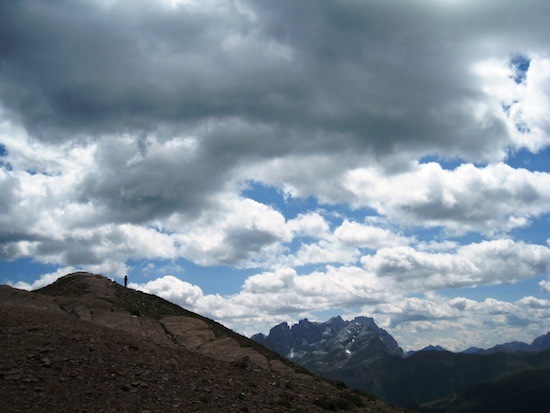 We made this hike in July, we got all kinds of weather and often on the same day. Sun, fog, rain, wind… it only snowed once. We were away 14 days but you can do it in much shorter time. 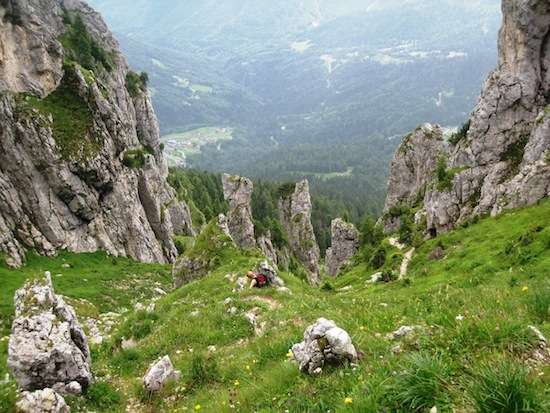 Alta Via 2 starts at Bressanone and ends at Feltre. We didn’t do the last two stages since we ran out of time, we had reasons to take some longer breaks during the hike. 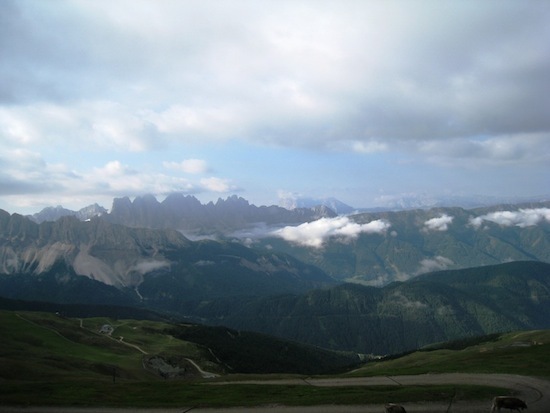 Our hike ended at Passo Cereda. 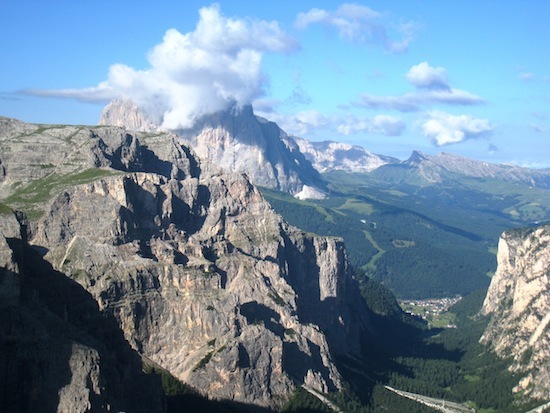 Alta Via 2 is beautiful and in some places very spectacular. It’s the hardest hike I’ve done so far and to be honest, if I had read the guidebook and maps properly before I went on this trip I probably wouldn’t have gone. But fortunately I didn’t. Instead I surpassed myself big time, and I loved it! I (Ýrr) went on this trip with my Icelandic friend Heiða. 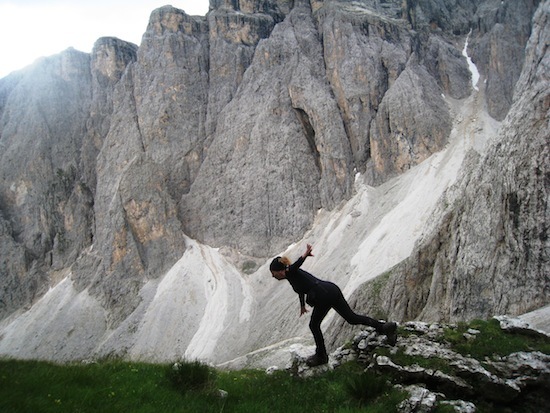 The guidebook says that everyone can do this hike but you should be en good shape and not suffer from vertigo. 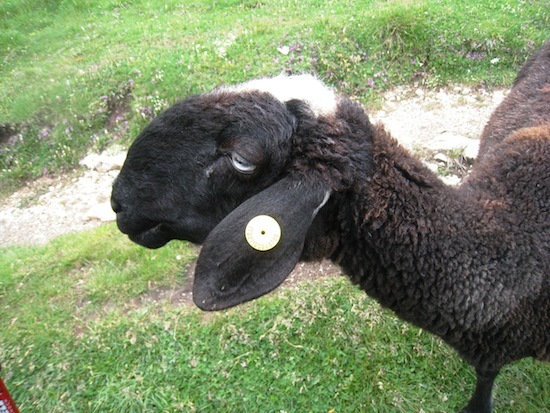 Well because of an accident Heiða was not in good shape and I suffer from vertigo. But we did it! Heiða (who has worked as a mountain guide in Iceland) really helped me through the steep parts with patience, she taught me some technique and in the beginning she took my backpack. But after a while I managed to do it myself. Day 11 was the toughest one. 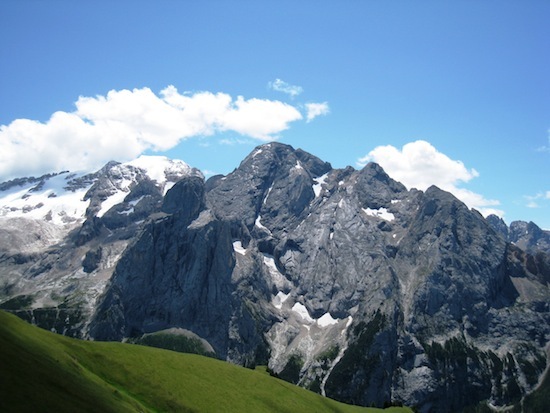 The conditions concerning rifuges and other things are similar to Alta Via 1. 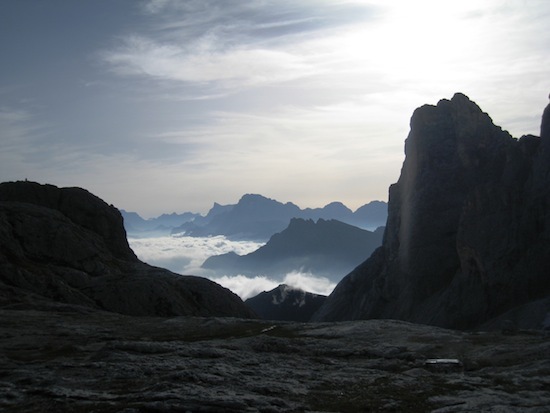 In some places there are alot of people, especially around Marmolada and some places are all nice and quiet. 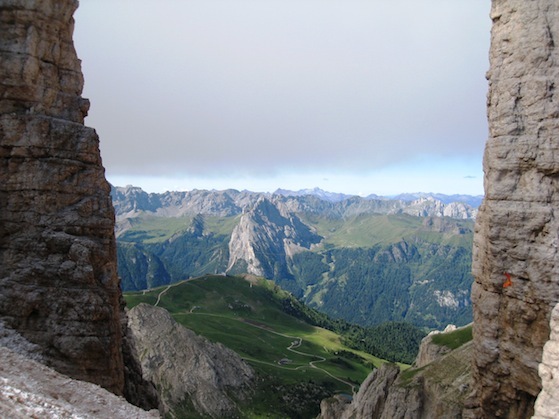 There are many of alternatives especially if you want to have some more excitement and don’t suffer from vertigo. 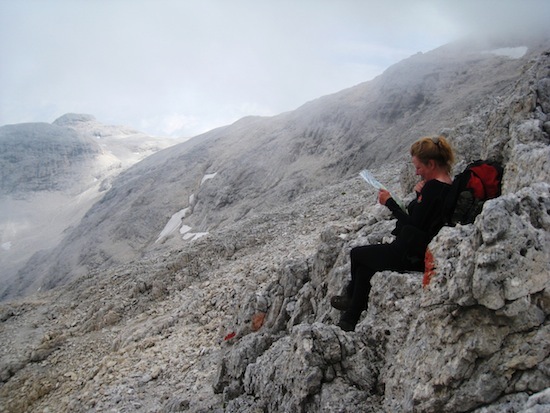 There are a lot of rifuges so there is often a possibility to have longer or shorter days. 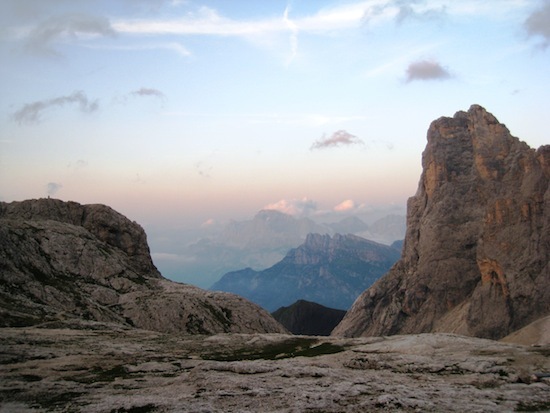 We only slept in Rifugios, it’s not very common to sleep in a tent in the Dolomites, we met some people that had tent but they often came inside since it often rained in the nights. 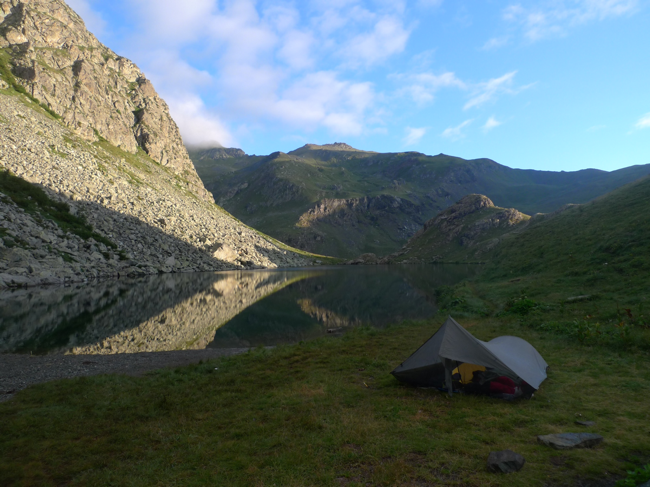 Most of the rifuges are placed on the tops and we often spent the night above 2000m. The food was good a mixture between the Italian and Austrian kitchen, often we could choose between pasta and knödel. Some times we made our own breakfast since the breakfast is often only white bread and jam and it’s expensive. 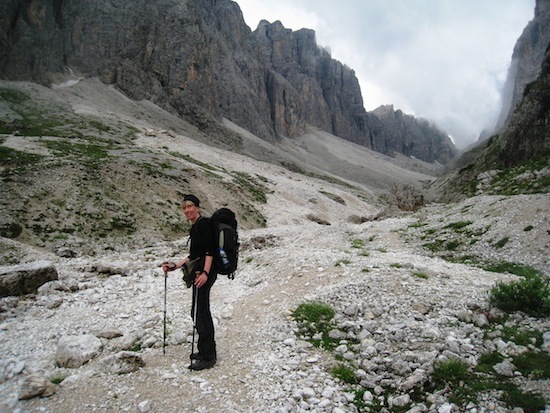 The guidebook we brought was Dolomites Trecking- Alta Via 1: Alta Via 2; second edition 2005 by Henry Stedman. Publisher: Trailblazer Publications. It was ok. 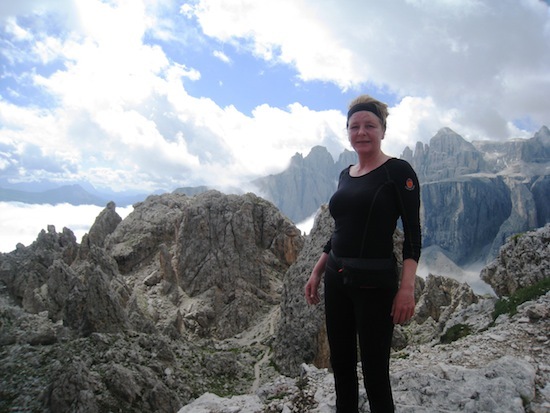 However we met people who had Trecking in the Dolomites by Gillian Price. Publisher: Cicerone. I think I prefer that one. In the cable car on my way up! 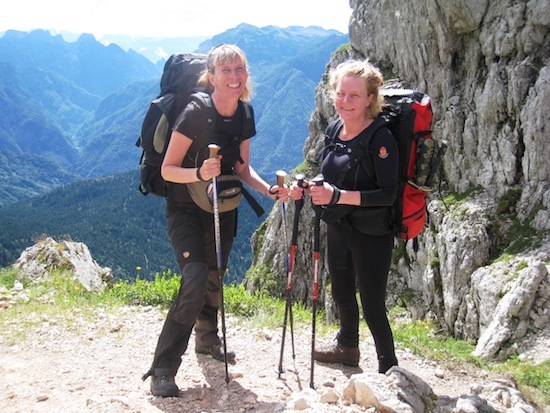 We spent the night at Kassianeum Youth Hostel in Bressanone. A lovely place, we had our own clean and comfortably room and the staff was really nice and helpful. After breakfast we went to buy the maps and other stuff we needed. 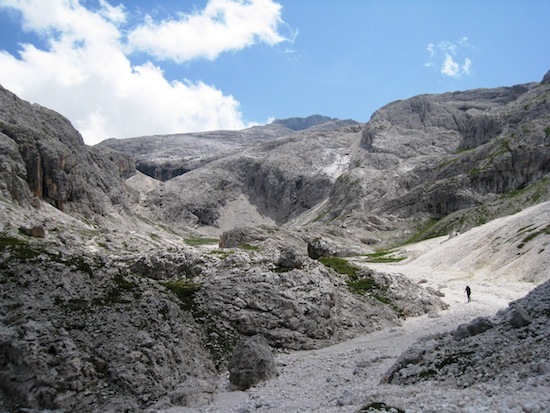 Around 12 o’clock we took a bus to St Andrea (961m) where there was a cable car that took us to Rif: Geisler. We walked a little before we sat down to eat some lunch and to enjoy that we finally were up in the mountains and on our way. 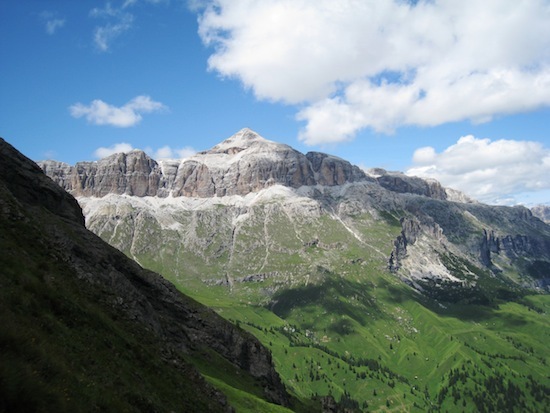 We walked upwards for about a hour before we came to Rif Polse a big rifugio that has, as many rifuges in the Dolomites, much more visitors during the skiing season. We had a beer before dinner and in the evening we played Yatzee. 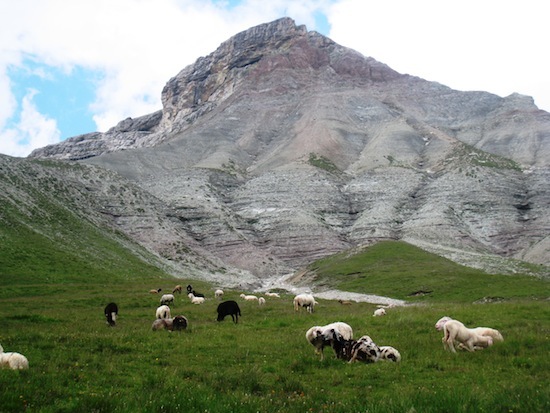 Outside the rifugio there was a horde of animals, cows, horses and sheep that made a lot of noise. We enjoyed them and it took a while passing them. We started by walking down through a forest, it was easy and comfortable walk. We met a guy from Germany Johannes on the way and he joined us. We stopped in a ravine for lunch but it was a short stop since it started to rain. We walked upwards, in the beginning it rained really hard but after a while it fed. It was a beautiful forest with trees with big roots, the landscape reminded us of Lord of the Rings. At the top we sat down on a bench before we started to walk down to Rif Genova. We arrived at 3 o’clock. People were sitting outside eating and chatting. 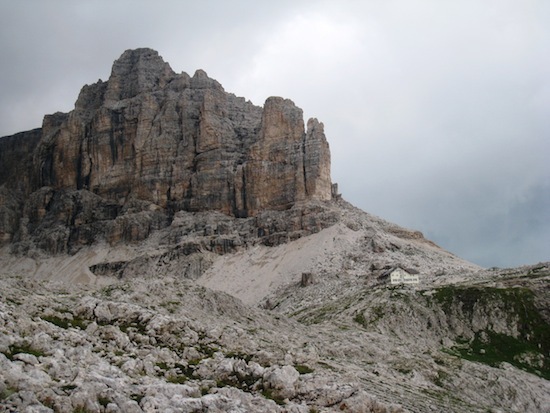 We got our beds in a big room in a basement, we didn’t really like the room but there were no opportunities the rifugio was fully booked. We had dinner with some people and we ended the night by playing cards with Judith and Roger from Wales and Johannes . 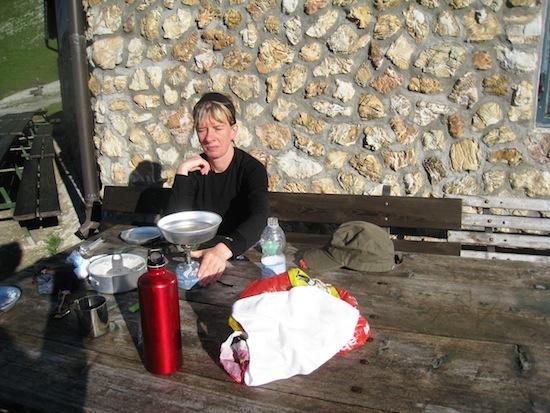 We made our own breakfast outside the rifugio before we started the walk of the day. It was a beautiful morning. 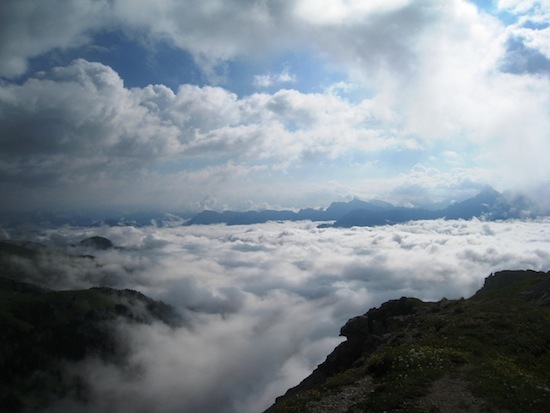 We found ourselves above the clouds. 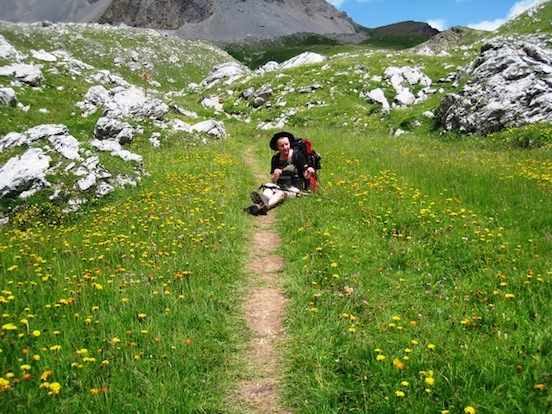 We made it to the top Forcella della Roa (2617m) before we headed down a little and sat down on the grass for lunch. Then we started climbing again. 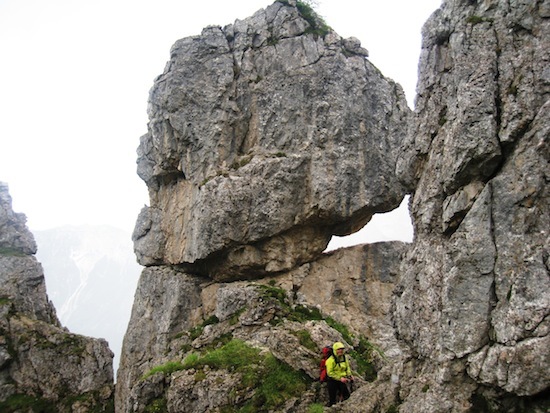 It became a little rocky and difficult and at the top it began to thunder. We sat down under a rock and waited patiently. 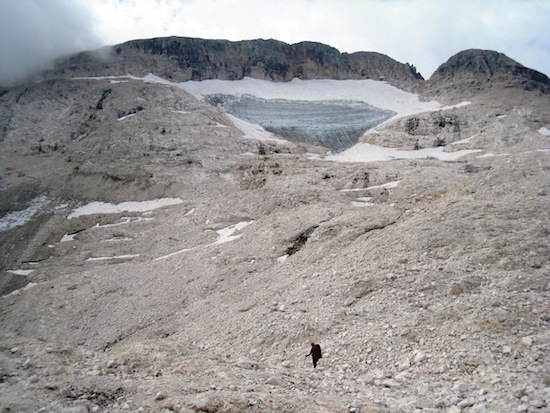 When it finally stopped we continued, which seemed like forever, before we reached Rifugio Puez. We had a typical Austrian dinner gulach and knödel for dinner. And then we played cards with our new friends. Roger taught us to play Bridge, which was fun but of course we got tired early, after a long and hard day. We had breakfast in the morning sun. 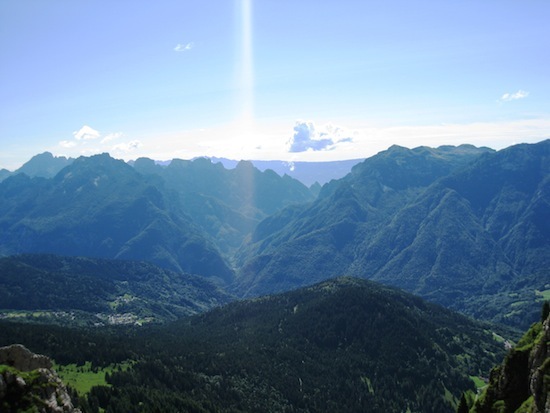 We took it slowly in the sun climbing up to Passo Crespeina (2528m). 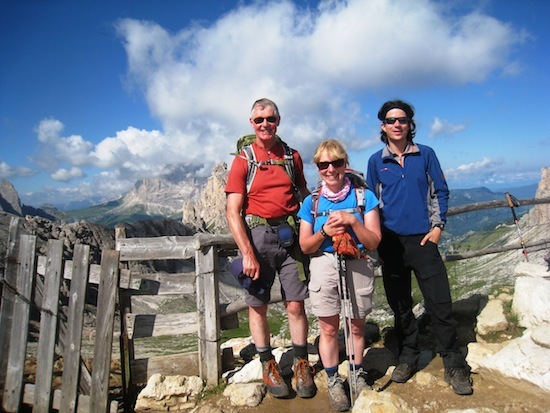 Roger, Judith and Johannes at the top Passo Crespeina. After about two hours walk we arrived to a restaurant Jimmy. We sat down, Heiða was really tired, her backpack was way to heavy (she had packed it of habit for the Icelandic mountains). 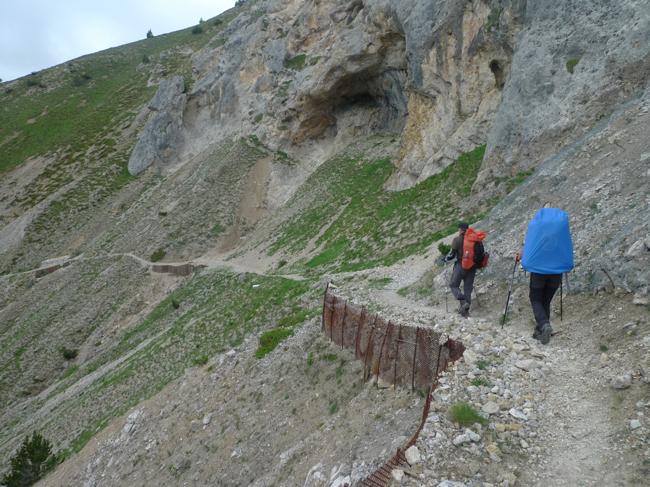 We had a really difficult walk a head of us to Rif. Boe, the sun was still shining but the weather was changing. We decided to take a break. I realized that we were right in the middle of my skiing area, where I go skiing every winter. 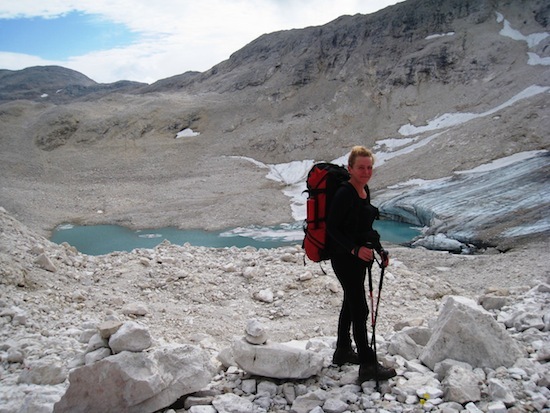 We decided to walk to Selva my ski town and send home some stuff from Heiðas backpack. 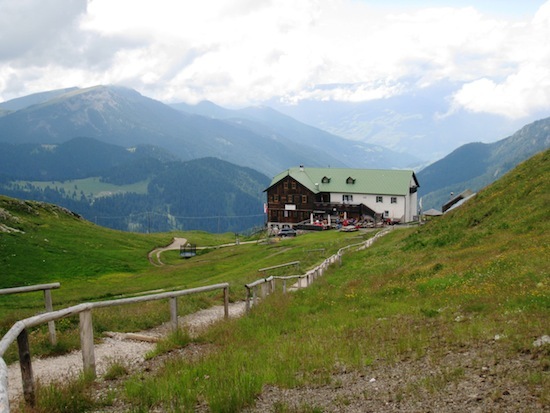 I was really happy since we had the opportunity to visit Baita Panorama Hütte, one of my favorite spots in the world, a restaurant/bar I visit every day on my skiing vacation. Panorama was different in the summer surrounded by green hills and it was all nice and quiet. We had a Prosecco at Panorama and got help from the lovely staff to book a room in Selva. We continued down the Danticheppi the hill I’ve skied down hundreds of times. Down to Selva and to the wonderful Garni Aghél where we got a big room with a big porch. We washed all our clothes and went out for Pizza. We had a wonderful breakfast at the Garni. The weather was really bad, it rained and it was foggy. 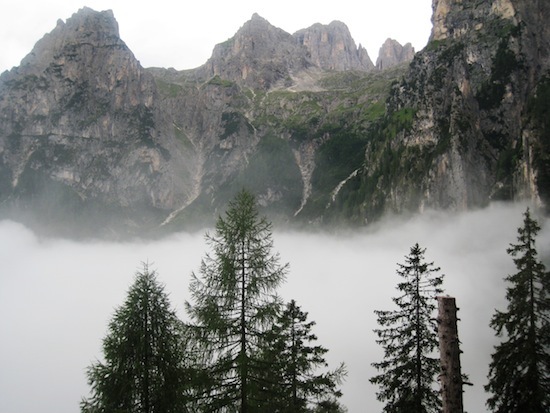 We decided to stay in Selva. We went to the post office and sent home 3 kg stuff from Heiðas backpack. Then we had lunch at Hotel Europa. The weather got better in the afternoon and I was sitting in the garden reading a book while Heiða went through the whole trip on the maps. She realized something that I didn’t want to realize namely that we would have to pass many via ferratas climbing on wires. She persisted on buying me climbing gloves (for that I’ll always be grateful) and she went to the sport store. I went to the spa at the Garni, it was wonderful. We had dinner at La Bula really delicious home made pasta! 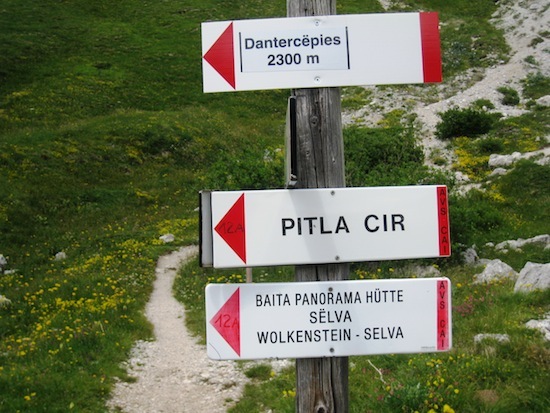 We took the Dantercepies cable car to the top and walked down to hotel Cir. 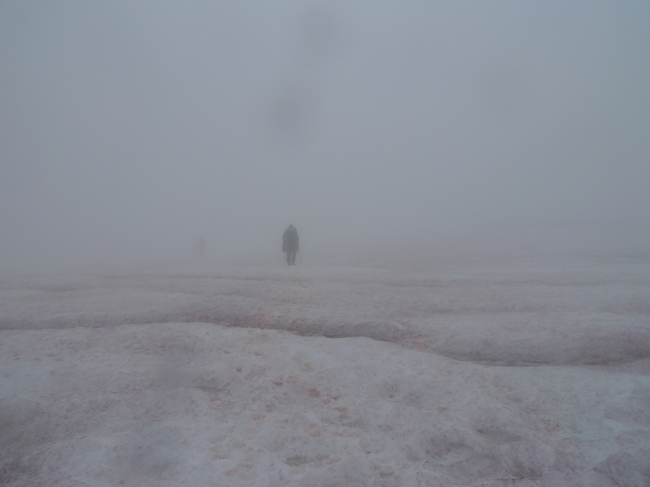 We were a little unsure about the weather, but after a cup of coffee we decided to continue. 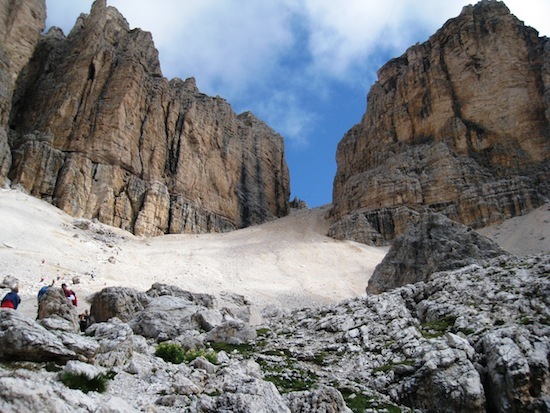 According to the map and the guidebook we were about to do the first via ferrata, I had been so nervous about this since the beginning of the trip. But we found a alternative way on the map. 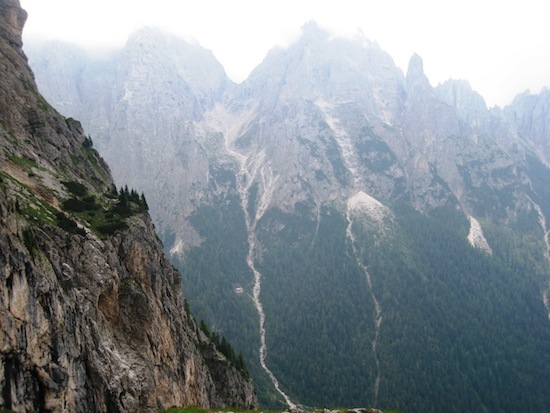 It was longer, but no via ferrata! We decided to take the alternative. I was so relieved! 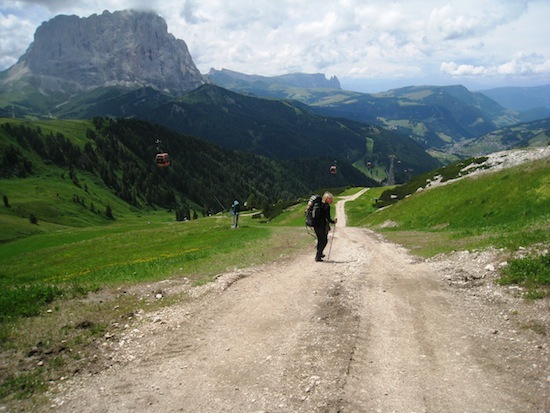 We walked along the mountainside towards Corvara, after about a hour we turned into a beautiful valley. We really enjoyed this walk, this rocky valley. But it became more and more steep and we didn’t see the top. Suddenly there was like a wall in front of us, with wires! 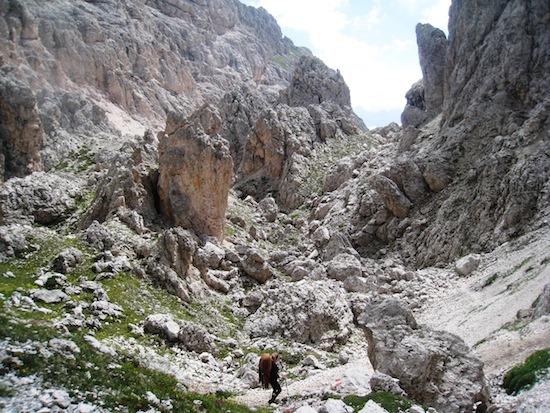 The map had fooled us, the only way up was through this via ferrata and it looked terrible if you ask me. Even Heiða became a little worried, but she is a tough girl and she went up! Then she came back, took my backpack and I took the wire. I was scarred as hell, but I took it really slowly with Heiða right behind me. I was happy for the gloves she bought me and for the rope and hook she had forced me to buy. The fact that I could hook me in wire made the whole thing doable. The thought that I wouldn’t fell down and die if something went wrong helped my from panicking. And I did it! I had outdone myself for the first time on this trip, it was satisfying. 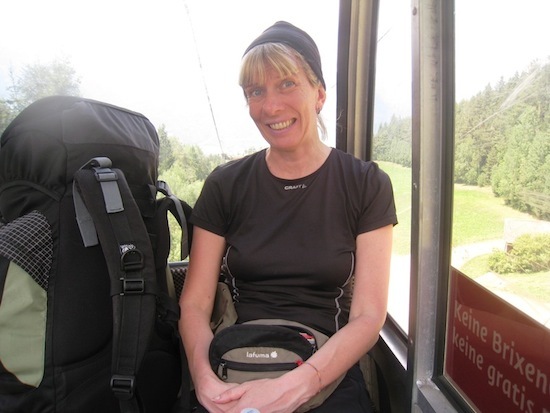 Smiling after my first via ferrata! 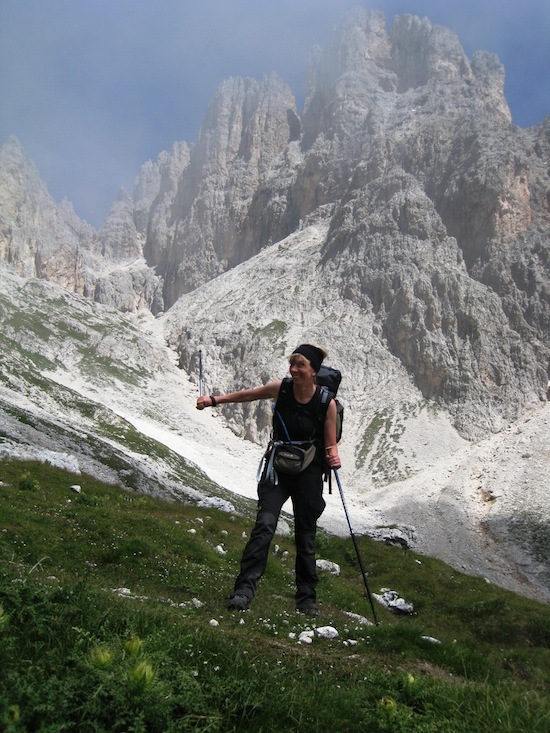 When we came to the Rifugio we had a big beer! Propably one of the best beers I’ve ever had! 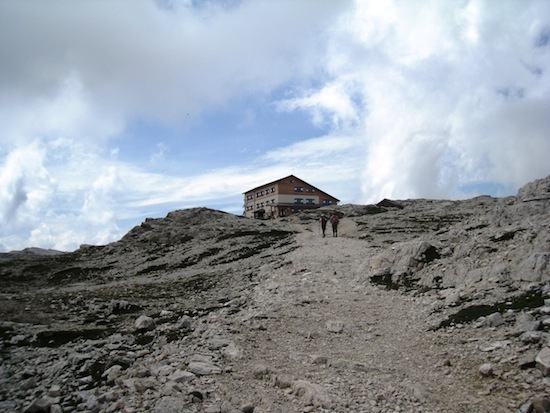 It was Saturday night, and the rifugio was full of big groups on weekend trips. It was probably the most tiering night we had on this trip, but fortunately we got our own room to sleep in. 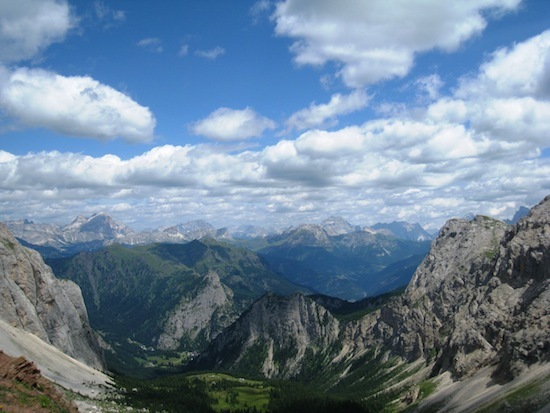 The view from the rifuge was stunning! It was really worth the effort to come up here! We woke up early as usual but it was raining really hard, we stayed in bed for a couple of more hours. It was ok since we were only doing a short day. When we left the rif. the rain had stopped but the fog came and went. 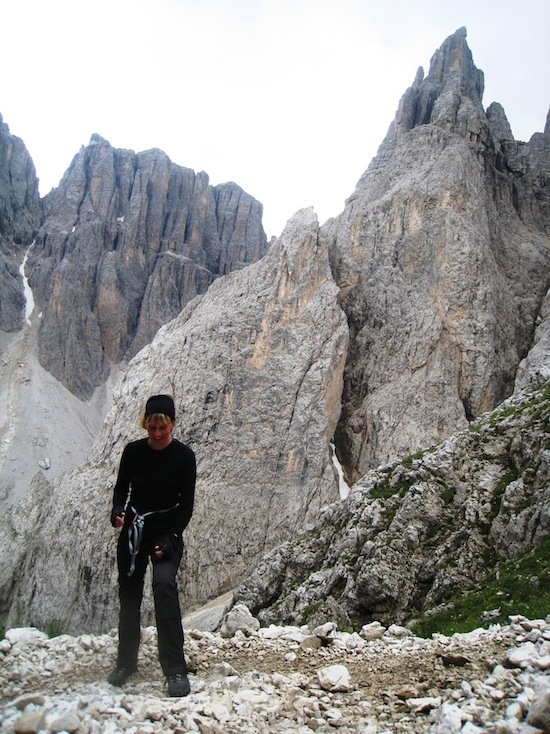 Pretty soon we came to the second via ferrata of the trip. This time the rocks were wet and slippery. I was terrified, but I did it! When we came up, it started to snow, but the snow melted away as soon as it touched the ground. 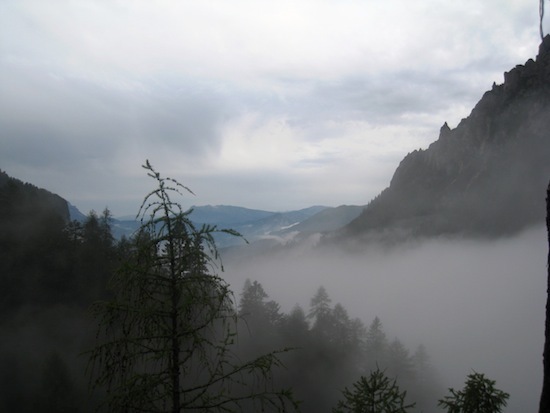 We walked up a rocky ravine and when we came to the top the sun was shining. We sat down for some lunch, the fog came and we continued, the view came and went in the fog. 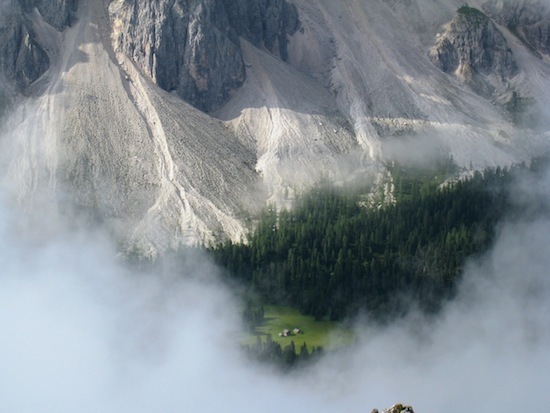 For a moment we thought we were lost we didn’t see anything but suddenly the fog lifted and we realized we were standing right in front of the rifugio Boe! 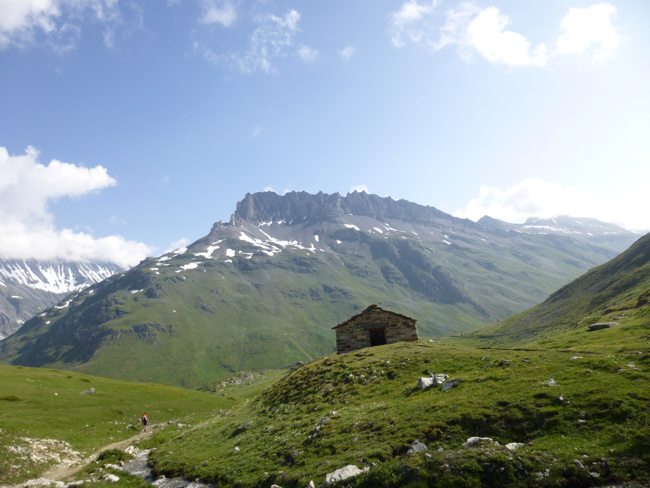 We really liked this rifugio, it was one of the best on this trip! 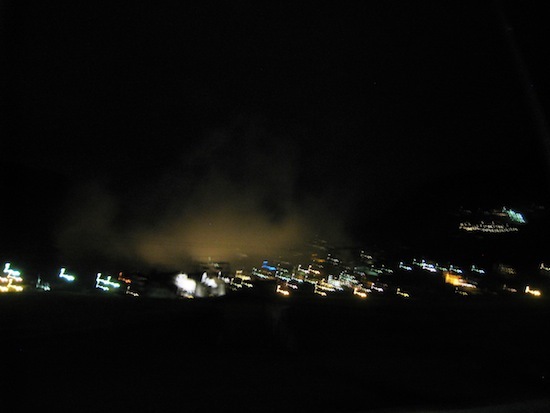 In the evening when we where playing cards with an Italian couple it started to snow! This was a all weather day! 15th of July. The sky was blue and the sun was shining when we woke up and the area was covered with snow. We had breakfast outside the rifugio before we left. It was slippery but beautiful! After about 45 min. 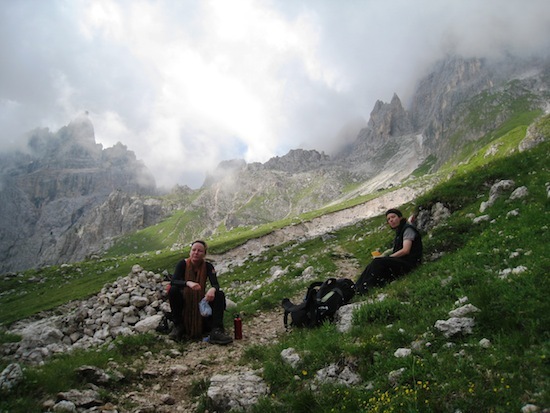 we came to rifugio Forcella. 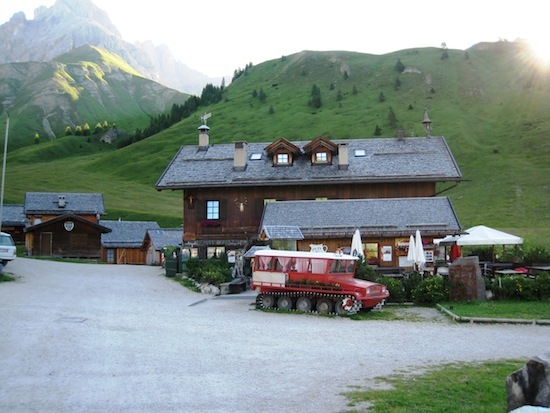 We had a coffee at the rifugio before we started to walk down the steep slope down to Passo Pordoi. The slope was full of people, we almost ran down the whole slope. 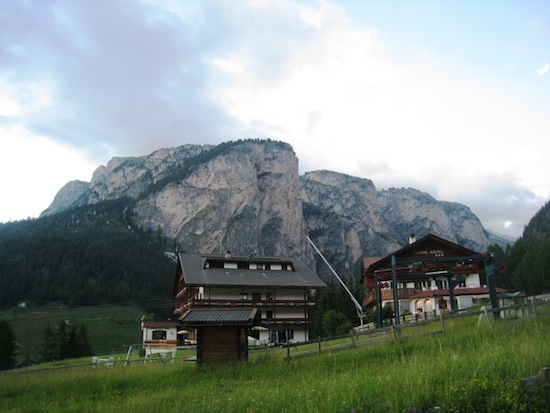 Passo Pordi is a skiing place with hotels and souvenir shops. 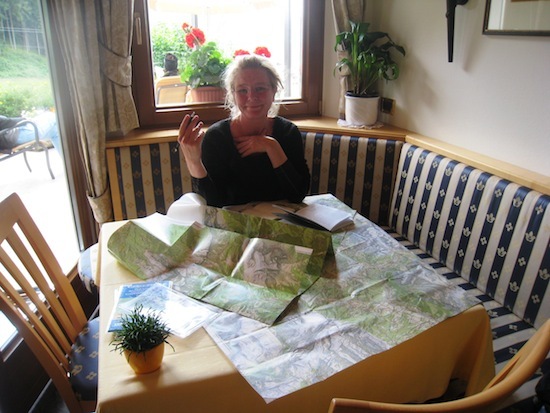 We made a short stop at a restaurant wrote some postcards before we continued walking along Marmolada. We were not alone, a lot of day tourists were on this trail. 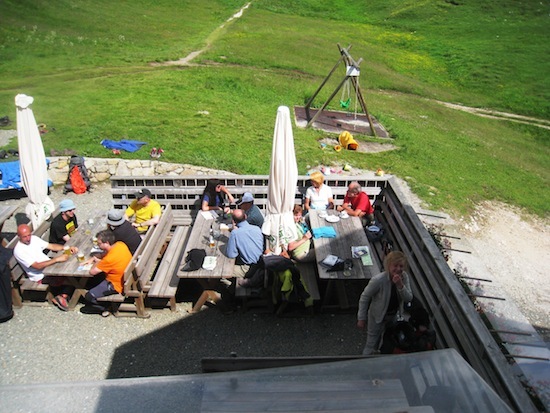 We had lunch at Rifugio Castigloni, it was crowded with people. I had some really tasty risotto. 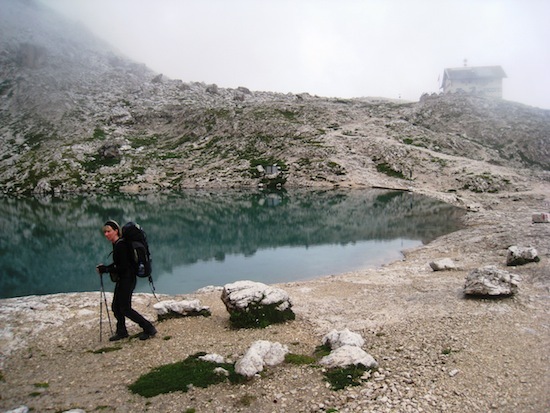 Then we continued down about 700m to Lago Di Fedaila. 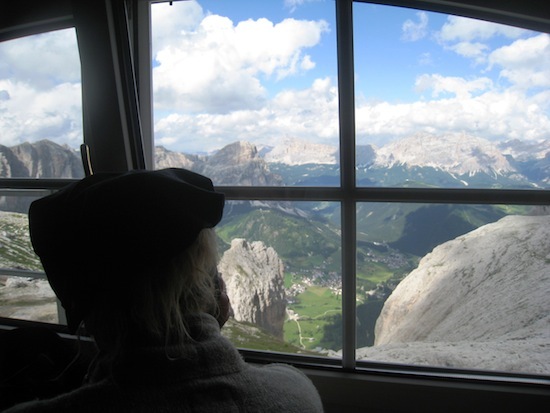 We didn’t feel like walking for two hours on a paved road so we decided to take the Dolomiti bus as the guide book recommended. 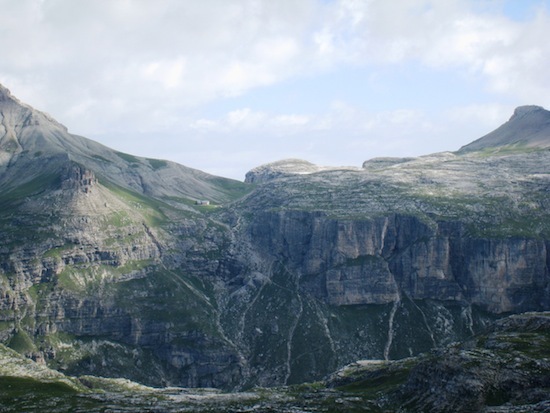 We took the bus to Rifugio Del Gigio. We sat down on the porch in the sun. 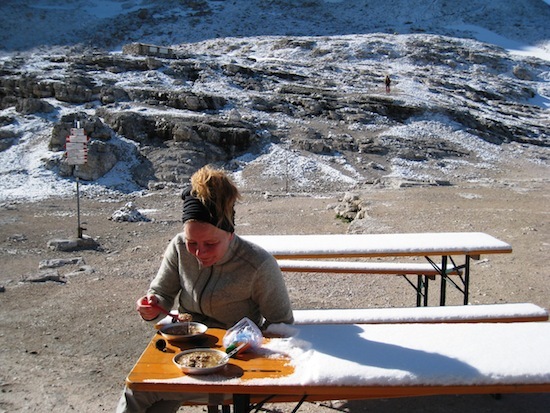 At this time it was hard to imagine that we had ate breakfast in snow! 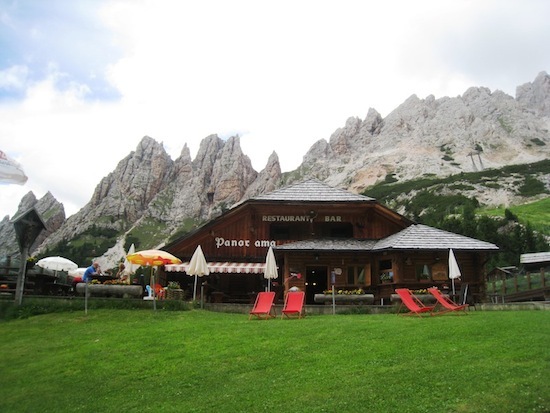 We had really nice food at this rifugio, my new favorite dish Ravioli with pumpkin, delicious! 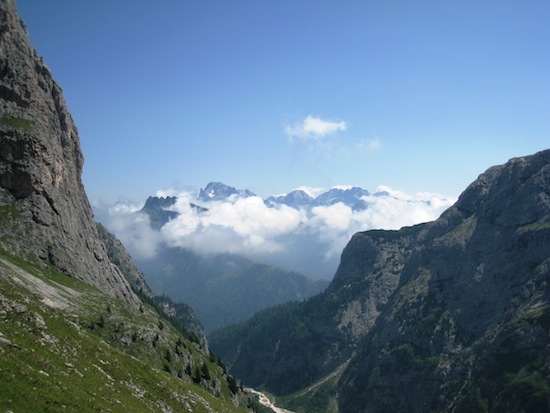 We startd by walking down the road to Malga Ciapela where according to the guide book should be a cash machine. But there was no such a thing. Anyway we continued into a valley it became more and more beautiful as longer and higher we came. It was hot and we were walking in a forest. We came to a small water stream where we refreshed. Closer to the top it became more bare and steep, we sat down and had some lunch before we climbed to the top. 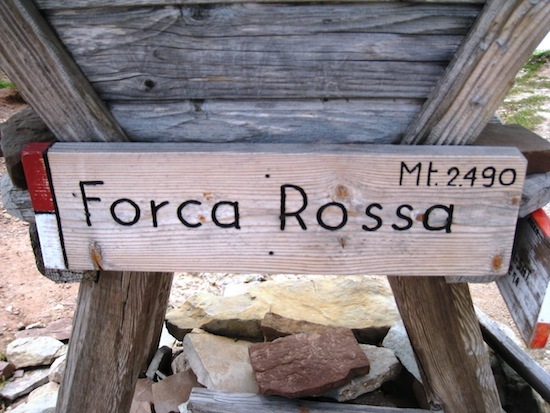 With some new energy we continued to Forca Rossa it was incredibly beautiful at the top! We enjoyed the view for a while before we headed down. We walked through fields with flowers. 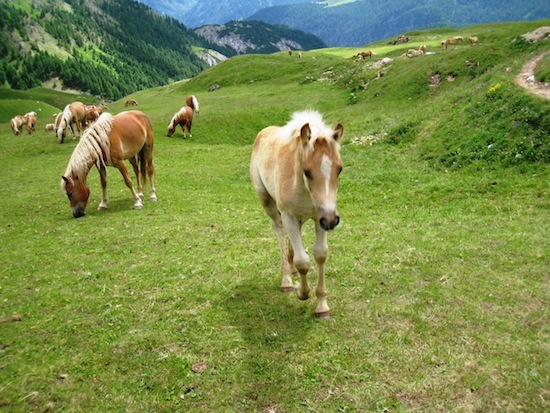 We walked through a horde of horses, they all looked the same, had the same color, it was a little strange. 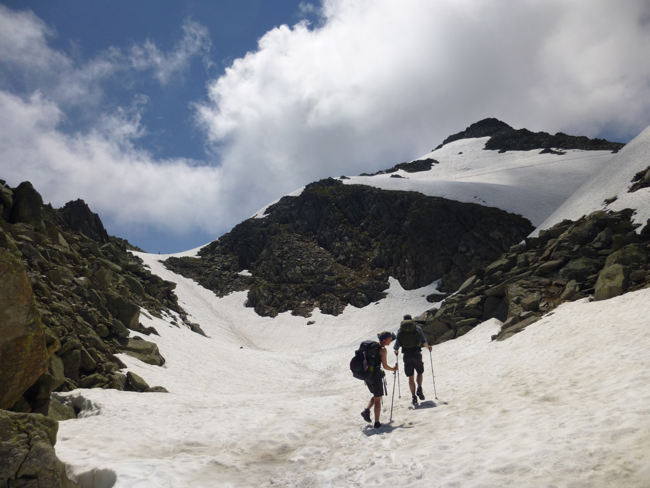 We continued to rifugio Fuchade. We sat down to make a decision if we should continue or not. We decided to stay even though this rifugio was quite expensive and it was still early in the day, but this stage ended in a skiing resort down the valley. We where not up to that, this place was beautiful and they accepted credit cards. Our room was really nice with two separate beds and a big bathroom. During the afternoon there were a lot of people sitting outside in the sun, children playing but in the evening it was all nice and quiet. I had delicious food! and a grande cheese board with cheeses from the area. We had a great night. We met this Icelandic girl that was by herself on an adventure with her tent. We spent the evening with her, talking, eating cheese and drinking red wine. We had wonderful breakfast at the Rifugio fresh fruit, yogurt, bread, juice and coffee. 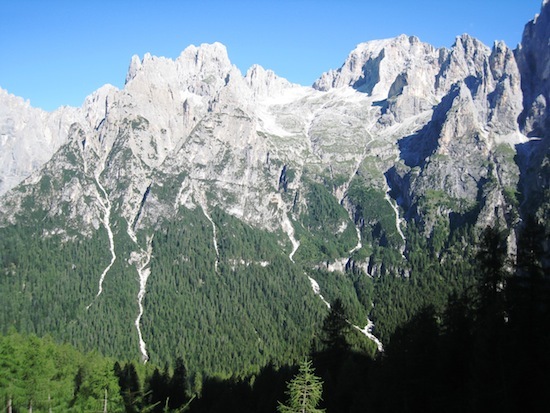 We walked down the valley to the end of this stage, Passo di San Pellegrino. We found a cash machine and then we headed up to the top. The hill had plenty of green vegetation. It was hot and the sun was shining. The view from the top was wonderful but we were in the middle of a skiing area it was a boring walk down a ski slope to Rifugio Passo di Valles 2012 m. We had lunch and rested before a long and difficult climbing started. Up, up, up we met a huge group of Italians in all ages small children, old people and everything in between it was a little surrealistic. We continued and we were quite tired and we had to to some via ferratas. 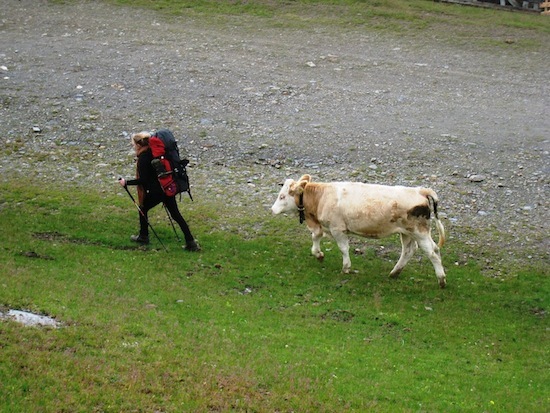 Heida coming back for my backpack. 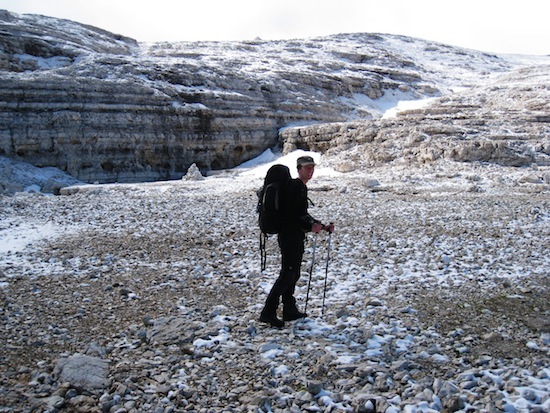 It was a long and difficult day, after lunch it was rocky and steep. 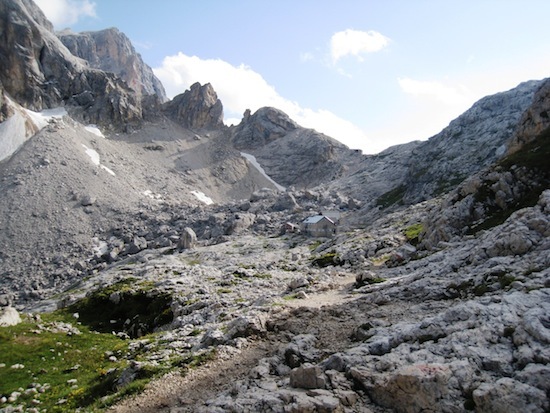 But we forgot all about the difficulty when we arrived to Rifugio Mulatz, it was just beautiful! 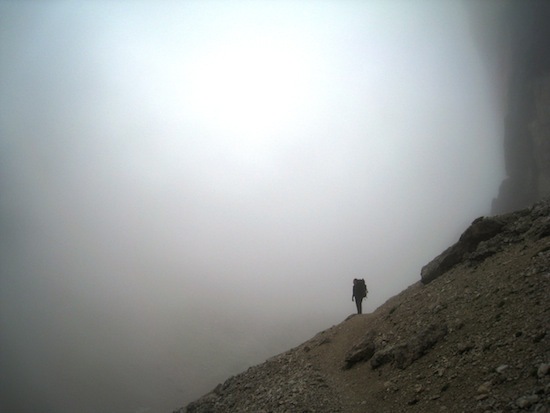 This was the hardest day I’ve ever experienced on my hiking trips, or maybe in life. It was a little bit of a nightmare for a person like me that suffers from vertigo. But I made it, and I’m proud of myself. 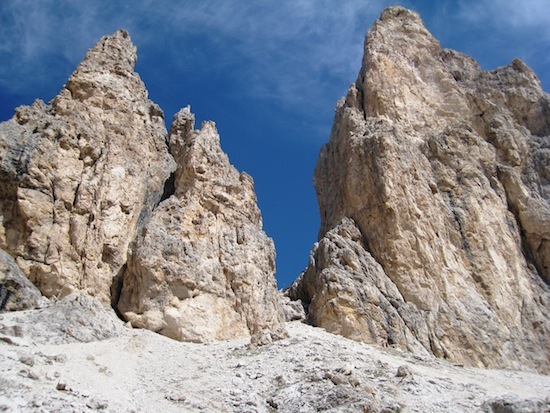 I knew from the guidebook that we would have to do the most difficult via ferrata on this trip, some vertical climbing. I was really nervous and I had nightmares. We started walking up through a ravine with loose slippery stones. 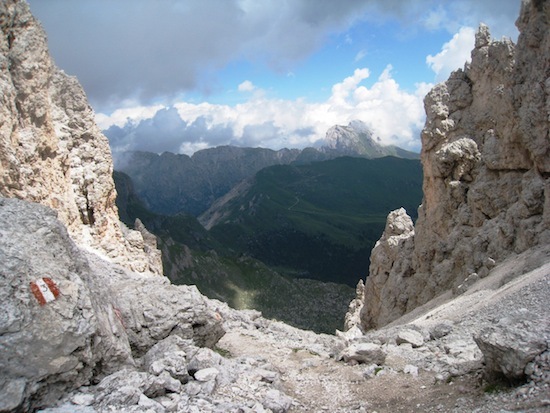 Pretty soon we came to the via ferrata. it looked terrible if you ask me! I was to scarred to take a picture. I realized I could not ask Heiða to take my backpack. There where some other people in front of us and I followed them, it was difficult for a vertigo suffering person, but it was doable, I did it! first I climbed vertical an then down on the other side. It was a relieve to come down to the other side. I thought I was done with the most difficult part of this day and this trip. 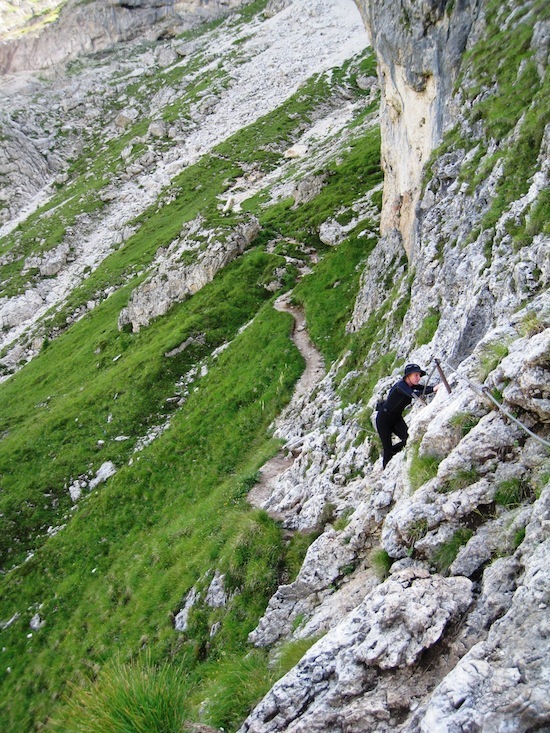 I knew we would pass one more via ferrata that day but it would be less difficult. We basically ran down the ravine. We took a break before we turned to walk on a path on the cliff face. 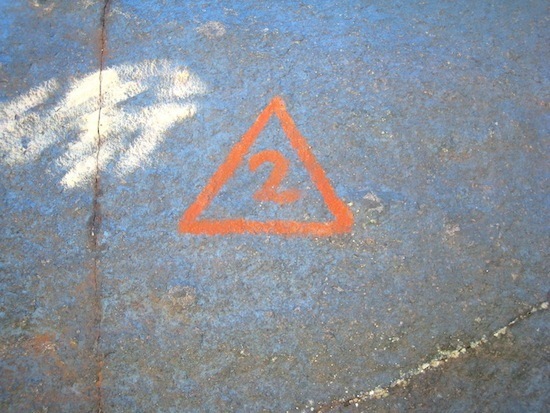 It was a narrow path and looking down was terrible, it was so steep. In between there was no path, just stones to climb over and no wires to hold on to. Actually I think this was the worst part of this trip. The via ferratas were always short, doing them I had wires to hold on to and I only had to be scarred for a shorter moment before it was over. But this cliff face never ended. We walked, and we walked and my legs were shaking the whole time. 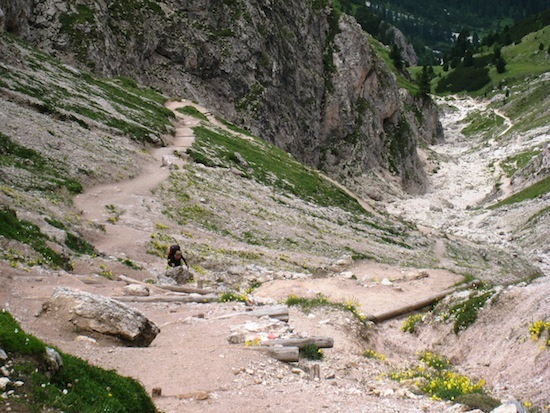 In the end we came to a via ferrata which felt like nothing after this terrible path. I was really relieved after I had done this. From now on there was a highway to the rifuge. After the green terrible cliff face the landscape changed it became more like a moon landscape, rocky with not so much vegetation. 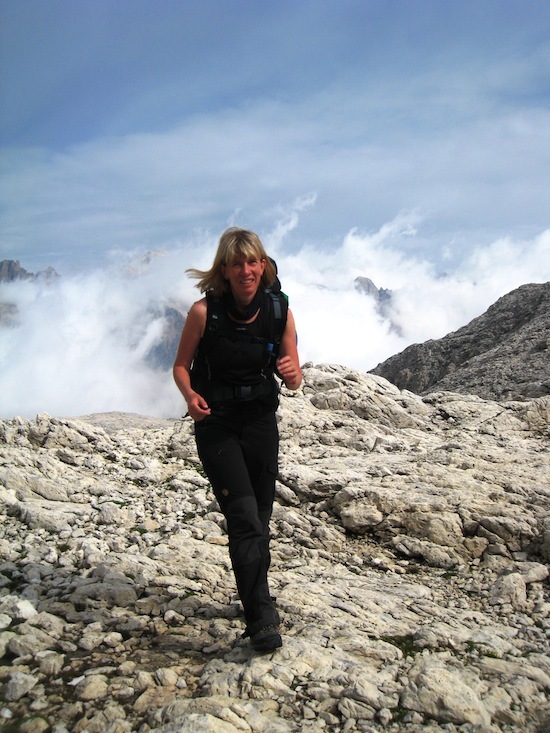 We came to the rifugio at three o’clock, I was exhausted after this challenging day. But I was happy! 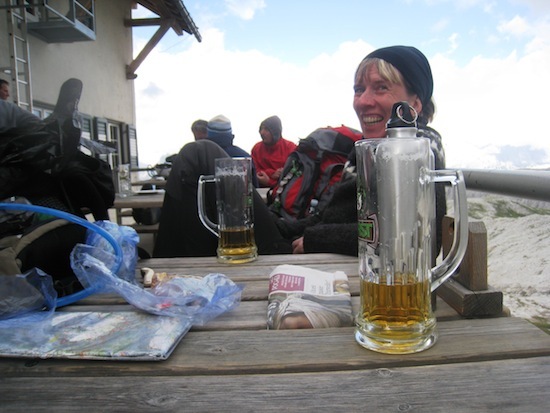 We had a well earned beer outside the rifugio ! We decided to take a alternative way. I was kind of shaky after the vertigo day before. 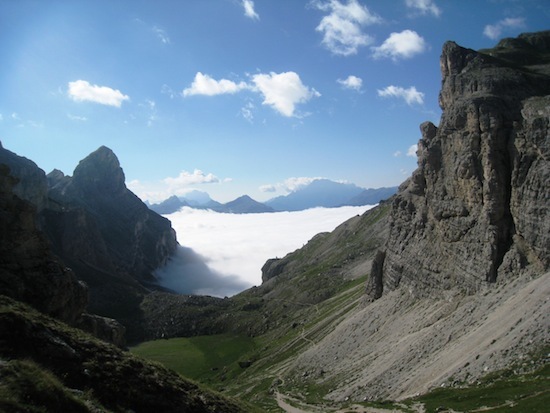 We decided to take a alternative way to th top Passo della Leda. 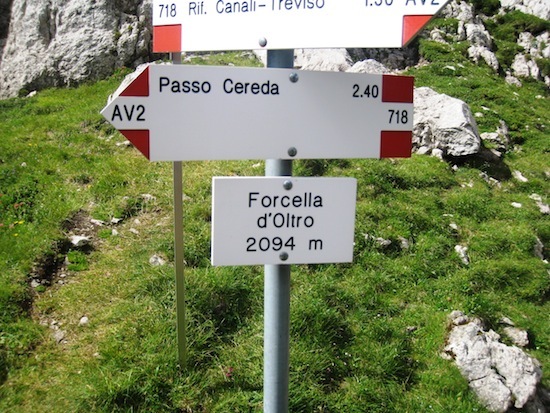 It was a little longer way but easier, no via ferrata climbing. We walked through a rocky beautiful landscape. The landscape reminded us of the Icelandic highland. After a while we came to the top Passo della Leda 2695 m.
After the top we walked down 1700 m to Canali valley at 1100 m. It was not difficult but really tiring especially in the end. 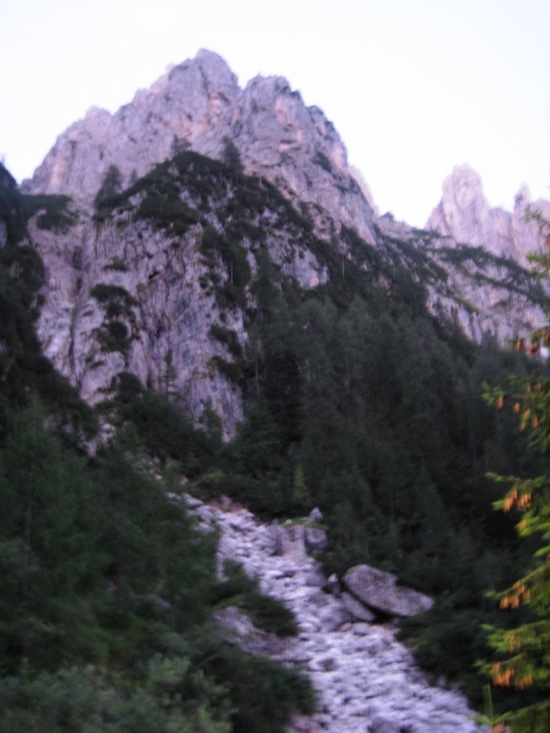 There was a water stream down in the Canali valley, we sat down and took a foot bath before we started climbing up though the forest to Rifugio Treviso 1631m. 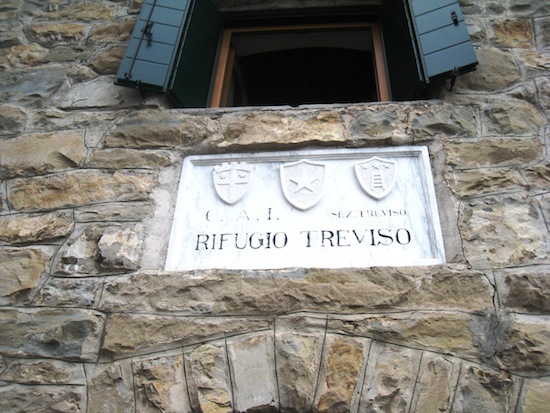 We just loved Rif Treviso. It was beautiful, we got our own room, the staff was really nice, the view was wonderful and the big room with its fireplace was so comfortable. We spent the evening with Helene and James a very nice couple from England we had been spending a view evenings with. We woke up and we were unsure about the weather. Heiða was really tired after the long walking down the day before. 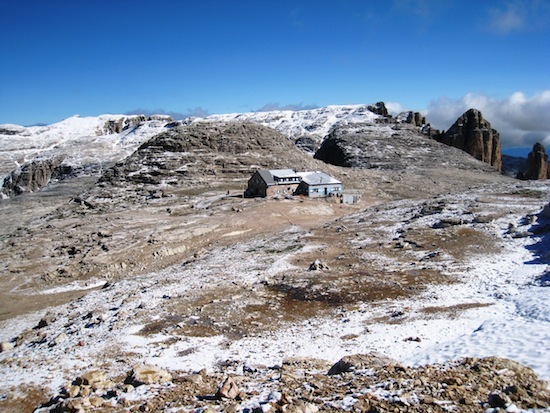 We decided to stay at the rifugio during the day. We just relaxed this day. Read books, played cards, looked at the view. The rain poured down some hours during the day. We woke up early, it was a beautiful morning the sun was shining. We were about to do our last day. We walked through the forest to to the top forcella d’Oltro. The last part was steep. This was our last top of this trip. We took a break at the top and enjoyed. View from Forcella d’Oltro, thr Alta via 2 continues this way. Then we headed down and it was steep, like on the other side, in the beginning. Then we turned left to a more horizontal path along the cliff-side. 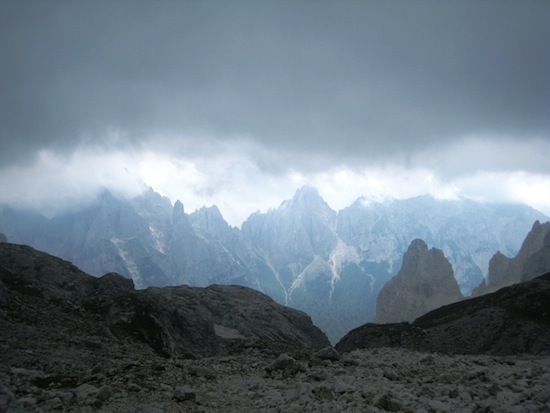 According to the guidebook this should be a beautiful walk with butterflies and nice view, but we didn’t really enjoy it, the weather changed, it started to rain. and it became foggy. Suddenly we came to this rocky landscape with huge rocks. 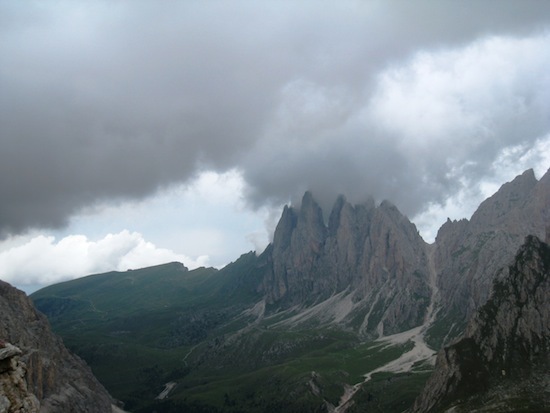 after we passed those lime stone towers th path took us down to Passo Cereda. This was the end of our hike! 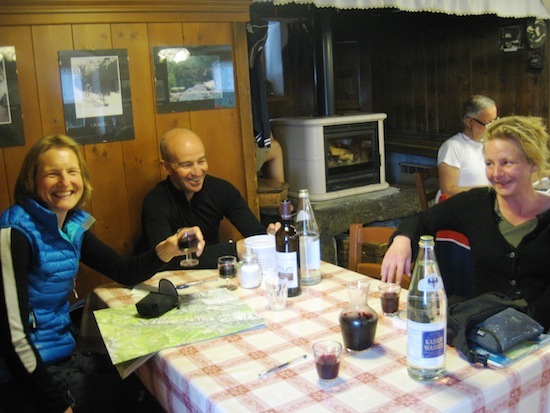 We had lunch at Rifugio Passo Cereda. It was a big place with good food and a lot of people were having lunch. After lunch we started walking down the street hitchhiking. A nice gentleman stopped and took us to Fiera di Primero from where we took a bus to Feltre. Feltre was full of men wearing Robin Hood hats, there were some hunting festival. 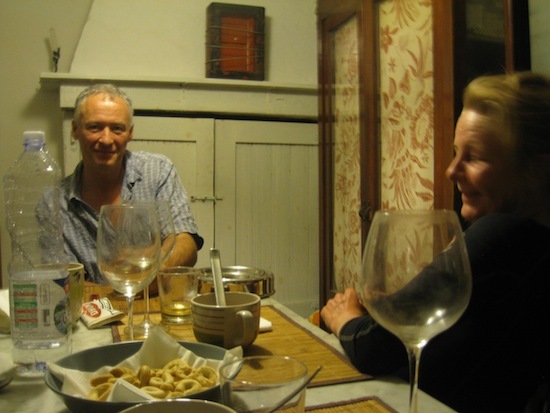 We took the train to Brescia where our dear friend Bruno cooked us delicious Sunday dinner. Ravioli with pumpkin! a lovely end of our wonderful hiking trip. 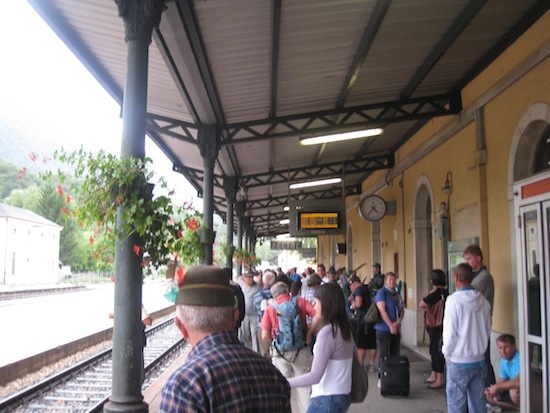 After a couple of days in Brescia we took the train to Umbria, but that is another story!